It snowed like mad this morning, the big fluffy Christmas flakes that make you feel like singing and making snow angels. It came down, so prettily, for hours and hours. Doc and I sat for awhile in the sleepy morning kitchen, musing over our coffee and watching it all flutter down and coat the branches without any of our usual misgivings, because Lo, I bring you tidings: he has got himself a snowblower and that has changed things. Snow is no big deal now, at least not this pretty little fairytale snow, this easy, harmless, candy cane snow, which is so easily shunted away with just a few minutes of peace-shattering, ear-splitting work with the help of a gas engine. Victory! A serious storm might be a different story, and I hope I don't have to report back on that this year. Please oh please, let Spring be upon my doorstep. I see some of you have your daffodils already, and I am eagerly anticipating them in my own garden. I have been doing a bit of hand stitching these past couple weeks. If it's not scrappy, is it even one of my quilts? 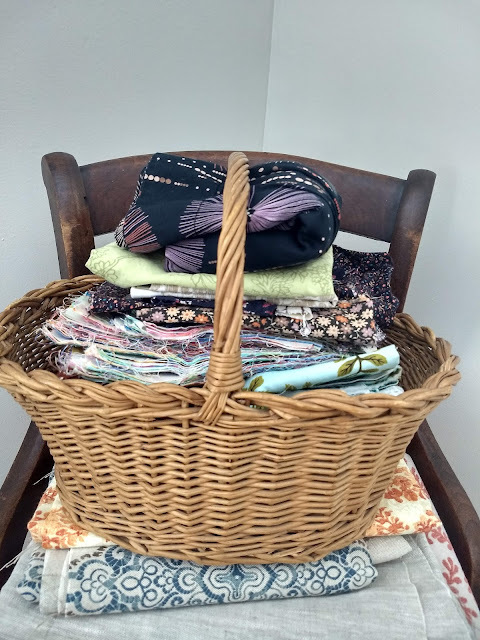 I just felt like doing some hand piecing, so I went to the fabric stash and pulled out some things, filling up a basket. I chose light solids and prints for the backgrounds and a pile of deep, bright prints for the foreground shapes. Some of those fabrics are, in fact, clothes from my closet. It was the right color! Nothing is safe from my scissors. I drew a template, cut it out from scrap cardboard, and just started cutting stuff up. I always forget how much I love hand piecing. It is so, so comforting. It just feels so good and right, you know what I mean? A needle and thread, a tiny pair of scissors. Some time. Oh, I just love everything about it. Underneath the basket you can see sone canvas and linen fabrics that are meant for pillow covers, and making those will probably only take two hours, but they require the sewing machine, and I am just not in the mood. 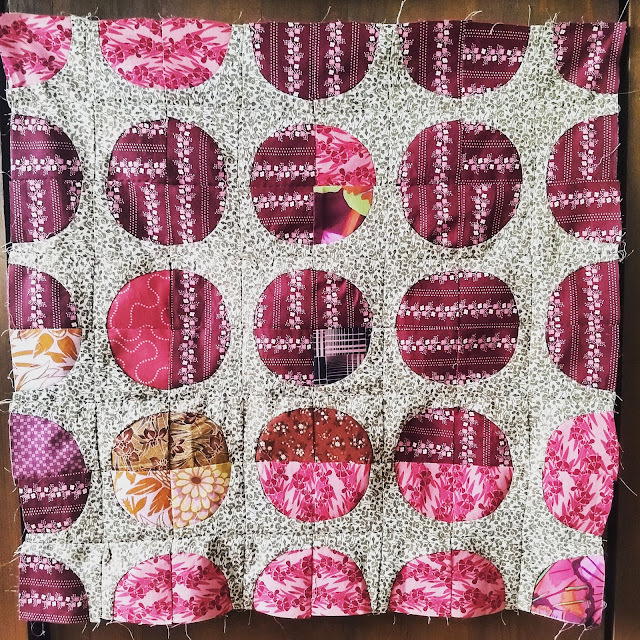 I just want to sew by hand right now, so I'll probably finish this whole quilt top--hours and hours of peaceful stitching with a needle and thread--before I even get around to starting to think about those pillow covers. That's how I'm rolling right now. 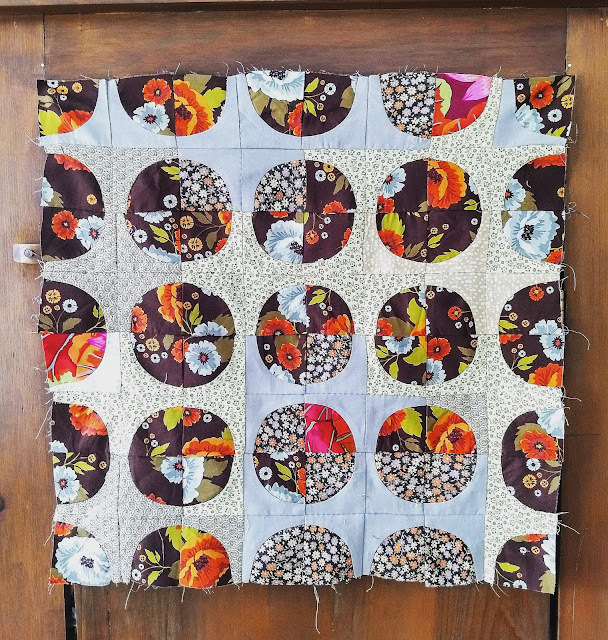 These bright, hand sewn circles just feel joyful to me. They are, actually, scientifically joyful. Have you seen this book? Friends, it is a manual for happiness. Get it, I mean it. Go on. Anyway, sewing: I'm planning to make nine of these blocks, with a solid sashing between them. Possibly in Kona "Pickle". I do dearly love that color. Or maybe something else will turn my head in the meantime. The sashing is a long way off. It is so good to be slowly making another quilt. Was hoping for pics of the snowblower but those of your most beautiful quilts will suffice in the interim! Just put the book on hold at my library. Thanks for the recommendation! Loving your drunkard's path blocks. Oh! I love this! I've been doing the same .....piecing a quilt by hand. I love cutting fabric out by hand with scissors. Foreget the time saving method with those roller cutters....I want to save my fingers, thank you. And I hate piecing a quilt with a manchine. When has that ever proved faster? I've never tried it that way. I love piecing by hand. You sound very happy and enthusiastic. I have never done any quilting. I do love darning socks and hand sewing, though. 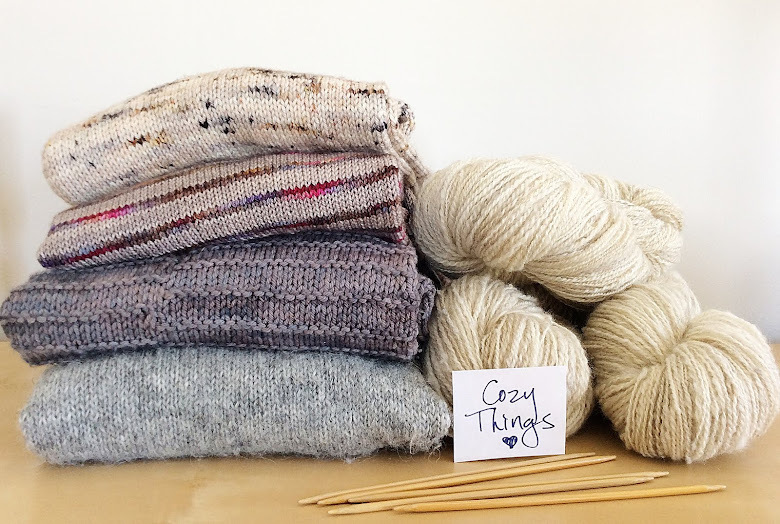 It's hard for me to imagine you not knitting a sweater! The snow blower sounds wonderful. I love modern day conveniences. Oh! That scrappiness is lovely!! I am a patchworker, but I've never done it by hand, although I do some of my quilting by hand. . . I am an appreciative consumer of your information. As always, love it.Cheers! I appreciate you sharing this. Cant wait to read your next post! 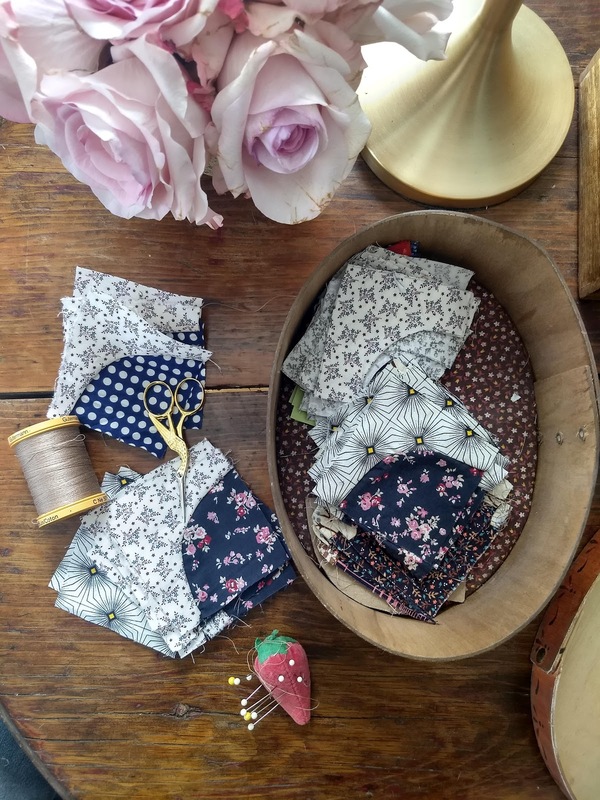 I really want to try hand piecing now. Thanks for the link to the book. I read the sample chapter and waiting for the library to say it's ready for me to pick up.